In recent years, the number of MRSA infections has reduced. However, there are still those that suffer from MRSA across the UK. If you have been infected by MRSA and you believe that someone else is to blame, such as the hospital you were being treated at or your place of work, you will be able to make a claim. You need to be able to demonstrate that someone else is to blame; you cannot simply show that you have been exposed to the infection. So, if you have been infected with this form of bacteria and you want to make a claim for compensation, all you need to do is get in touch. We have an abundance of experience in securing compensation for personal injury victims, and we can help you to get the maximum amount you are entitled to. But first, for more MRSA facts and information on claiming, simply read on. What can be claimed for after MRSA? Can I claim compensation if I contracted MRSA at hospital? How much compensation will I get after MRSA? Why choose us as your claims service for a MRSA claim? MRSA is a type of bacterial infection, which is caused by the Staphylococcus aureus bacterium. If you have been diagnosed with MRSA and you believe that someone else is to blame, such as the clinic or hospital you were being treated at, there is a very high chance that you will be entitled to compensation. MRSA claims can be somewhat complex, as it is all about proving responsibility. This is why you need an expert legal firm on your side that can give you the greatest chance of securing the maximum amount. This is exactly what you get when you work with us. We have years of experience and an exceptional reputation to back it up. But first, why not take a look at our MRSA guide below? You will find all of the information you need to know about these types of claims. This includes everything from the MRSA meaning and MRSA treatment, to MRSA compensation payouts and making MRSA NHS claims. MRSA stands for methicillin-resistant Staphylococcus aureus. It is also commonly referred to as a superbug. MRSA is a form of bacteria, which is resistant to a wide range of antibiotics that are frequently used. This becomes a problem because it means infections with MRSA are a lot more difficult to treat when compared with other types of bacterial infections. Is MRSA contagious? Quite simply, yes. In fact, this is how it is often passed onto people, through contact. MRSA actually lives harmlessly on the skin of roughly every one in 30 people. It is typically in the groin, armpits, nose, or buttocks. This is known as carrying MRSA or colonisation. Most people are unaware of its existence, and it does not bother them in the slightest. However, if an individual is carting the bacterium and has some form of medical problem that weakens their immune system, then staphylococcus aureus bacterium may become active and start to create problems. The bacteria starts to multiply rapidly once it gets into the bloodstream, and this can cause severe infections to other body parts. All details regarding the injury – It is important to gather all information regarding the incident. This includes making your own notes about what happened, as well as holding onto any medical reports. Photographs – If any of your injuries are visible, it is a good idea to take photographs of them. Witnesses – Did anyone witness the negligence you suffered? If so, make sure you get their contact information. Witness statements can really help to boost your case. Proof of expenses – It is important to keep a hold of any proof of the expenses you have suffered. You can claim for these as special damages. Examples include loss of income, childcare costs, travel expenses, prescription expenses, and the cost of counselling. So long as the expenditure was encountered as a direct consequence of the accident, you will be able to claim for it. Starting a claim for MRSA is easy when you have our help. All you need to do is give us a call and we will be there for you every step of the way. When you call us, we will happily answer any query you may have and talk you through the process involved when making a MRSA claim. We will also ask you some questions too. This is part of our free consultancy session. It is important that we find out the facts of your case here so that we can advise you effectively. You will also be pleased to know that we work on a No Win No Fee basis. This means that you will only need to pay legal fees if your case is successful, therefore, offering you a significant degree of monetary protection. You can find out more about No Win No Fee and why it is so beneficial below. In some cases, a local medical needs to be arranged. This is nothing to worry about. We will happily arrange if for you at a local clinic, with no cost involved. Again, this is something we can discuss further once you get in touch. There is also the chance that you may have contracted MRSA at work, especially if you work at a health clinic or hospital. If this has occurred, you may be entitled to a MRSA workers compensation payout. All employers in the UK need to follow legislation to ensure that the workplace they provide is a safe and healthy one – healthcare providers included. If your employer has failed to do this and you have been infected with MRSA as a consequence, you may be able to launch a claim. In order to do this, you need to show that your employer has not taken the necessary steps to reduce the chances of MRSA contraction to the lowest possible level. General damages – This is a term used to describe the compensation you will receive for the pain and suffering you have encountered. Loss of earnings – You could also claim for loss of future potential earnings too. Care claim – If someone has had to help you around the house while you recover, they can file a care claim. It is important to note that the MRSA symptoms you experience will differ depending on what part of your body has been infected. Heart infections are going to be different to blood, bone, or lung infections. Is MRSA contagious is another question we are frequently asked. It is, and this is usually how people end up contracting it. You may need treatment to remove MRSA from your skin. This is called decolonisation. Treatment is usually done at home. It involves the application of an antibacterial cream and washing with antibacterial shampoo. You will also need to change your bedding, clothes, and towel daily during the treatment. The laundry in question needs to be washed at a very high temperature, and it should be washed separately. Do not include any other laundry with it. If you have an MRSA bug infection, you will usually be given antibiotics. These can be given as injections or as tablets, and treatment can last anything from a few days to a few weeks. You may need to stay on your own during the treatment – in a secluded room. Or, you may be in a ward with other people that have contracted MRSA. This is to make sure you don’t spread the bacteria. 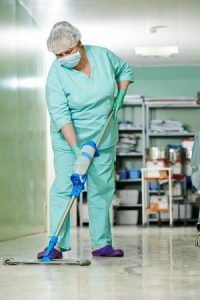 You should report any facilities that are unclean to hospital staff. If you are considered about the hygiene at the hospital you are stating in, do not be afraid to say something. Follow the advice provided to you regarding wound care. Look after any devices that could cause an infection. Examples include drips or urinary catheters. You should also wash your hands regularly. Alcohol hand gel and hand wipes are also great. Make sure you especially wash your hands after you have been to the toilet, as well as before and after you have eaten. Can you sue a hospital for MRSA? If you have contracted an MRSA virus during a stay at hospital, there is a chance that you will be able to claim. In fact, most MRSA claims are for medical negligence. You are, after all, more likely to have a compromised immune system if you are weak or ill. This means you are at a higher risk of contracting MRSA while you are in hospital. If you are being administered the drip or you are having surgery, there are a number of opportunities for the bacterium to enter your bloodstream. The most common ways for bacterium to pass to you is through infected hospital equipment or the hands of someone else infected. These are the most common MRSA causes. There are strict guidelines for NHS staff and healthcare provides across the UK on preventing MRSA infections. If the hospital you were being treated at has not followed these guidelines, there is a very high chance that you will be able to secure compensation. The Control of Substances Hazardous to Health (COSSH) Regulations 2002 state that hospitals have a responsibility to lower harmful substance exposure to the lowest level that is possible. If a hospital is in breach of the COSSH Regulations, as they have failed to enforce appropriate procedures and policies, you may be able to make a claim. Unfortunately, the law regarding this and MRSA claims is rather sketchy, as the Courts have not considered whether COSSH is applicable to patients with MRSA. The second type of claim you can make is for negligent treatment of MRSA. In order to launch successful MRSA claims, you need to provide that the hospital managed your case of MRSA negligently once you had been contracted. You then need to prove that the negligence you experienced resulted in loss and injury. These cases focus on what has happened once an individual has MRSA transmitted to them. For example, whether suitable antibiotics were provided or whether infection signs were picked up on at the speed they should have been. For this type of claim, you need to show that you contracted MRSA while you were in hospital. You also need to show that the hospital provided you with treatment that was of a substandard level. You also need to show that you would not have acquired MRSA if the treatment had not been so poor. And, finally, it is essential to prove that you suffered loss and injury due to this negligence. When determining whether you are entitled to compensation, the court will consider whether the hospital has taken all of the required precautions to lower the infection risk to the lowest level they could. No matter what type of hospital MRSA claim you are going to make, all you need to do is give us a call and we will help you along the way. We have all of the experience required to put your mind at ease, and we will advise you on the right type of claim for your circumstances. Loss of anticipated earnings £10,000 - £400,000 This is based on the pay grade you currently receive, as well as your future prospects. There is potential for a higher payout determined by future earning prospects. Loss of benefits £5,000 - £500,000 This is calculated based on the actual income you have lost. Again, you could receive more than the maximum in certain cases. Pain and suffering £1,000 - £200,000 The level of suffering and pain experienced drives this payout. Severe pain disorders £32,000 - £47,875 In such cases, symptoms will be significant despite on-going treatment. There will be a need for assistance/care and there will be an adverse impact on the person’s ability to work. The symptoms are expected to persist. Moderate pain disorders £16,000 - £29,250 Symptoms will be on going, yet they will be of a lesser degree when compared to severe pain disorders. Severe psychiatric or psychological damage £41,675 - £88,000 The prognosis in these cases is usually very poor, and there will be marked problems with future vulnerability, the extent to which treatment would be successful, and the person’s relationships. Moderately severe psychiatric or psychological damage £14,500 - £41,675 These cases also include significant problems, yet there will be a much more optimistic prognosis. Moderate psychiatric or psychological damage £4,450 - £14,500 There may be some problems with the person’s relationships with others and their vulnerability, yet there will be a good prognosis with marked improvement by the trial. Less severe psychiatric or psychological damage £1,170 - £4,450 The extent to which daily activities and sleep were affected, as well as the length of the period of disability, will be considered when determining the level of award for these cases. One of the main benefits of using our service for MRSA disability claims is the fact that we operate on a No Win No Fee basis. This means that you only need to pay legal fees if your compensation case is a success. If, for some reason, we do not secure MRSA compensation for you, you won’t need to pay a penny. This is highly beneficial, as it means everyone can make a claim. There are no financial barriers in the way. When you claim with us, there is no way you are going to be out of pocket. There are many knock-on benefits to consider. For example, if you were to go for a solicitor that charged by the hour instead, there is always the chance that they would take on your case merely to take your cash. After all, the amount of money they make is not impacted by whether your case is successful or not. Instead, when you work with us, you know that we won’t mess you about or waste your time. We only take on cases that have a genuine chance of success. There are many legal firms in the UK that can help you to make a claim for MRSA infections, yet you will struggle to find a better company than us. That’s a promise. Not only do we have an outstanding reputation in the industry, but we have many years of experience as well. We have successfully secured compensation for many personal injury victims over the years. Another thing that we are proud of is our customer centric approach. We always put our customers first. We appreciate that you are going through an extremely difficult time at the moment. This is why we will work on your case as efficiently as possible, enabling you to concentrate on your recovery. We won’t pester you or hassle you, but we will always be available if you need us. If you are ready to make a claim for compensation, all you need to do is give us a call on 0800 073 8804. You will speak to a friendly and experienced member of our team who will be more than happy to assist you in any manner they can. We will answer any queries regarding MRSA lawsuit settlements and provide you with our expert advice on moving forward with a claim. This link takes you to the MRSA guide on the NHS website. It covers how you get MRSA, the symptoms, screening and testing, treatment, and prevention. There is also information on clinical trials. This link takes you the Health and Safety Executive website for the government, which explains the risks healthcare workers face. There is useful information on controlling occupational exposure to biological agents in a healthcare setting. If you have contracted MRSA or a hospital infection contact us today to find out how much compensation you can claim.